As I found myself traveling a great deal for work throughout the summer and fall, I also found myself daydreaming of a vacation where I was not on the move and could simply be. Be with my boyfriend. Be on the beach. And be in a luxurious location within easy travel distance from the United States. Mexico fit the bill, but a mega resort in a touristy locale—à la Cabo or Cancun—most certainly did not. 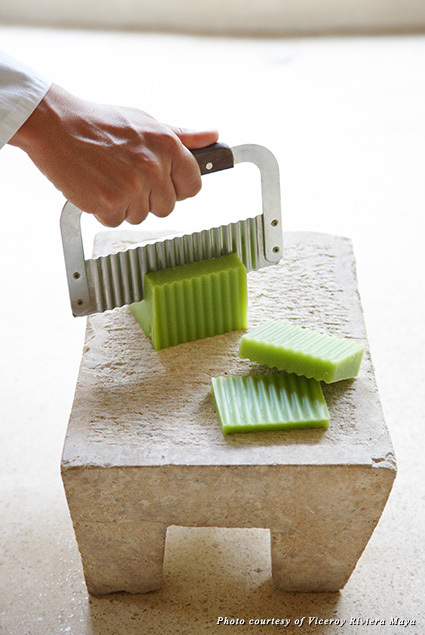 While I had previously vacationed at the Viceroy in Zihuatanejo, Mexico, I wanted to try something new yet stick to a familiar luxury. 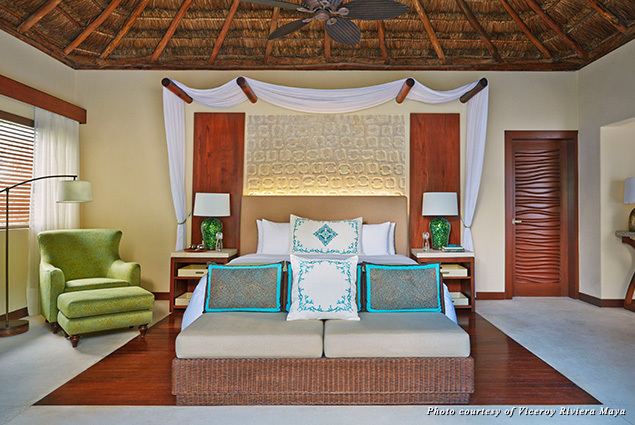 The logical choice was the Viceroy Riviera Maya. 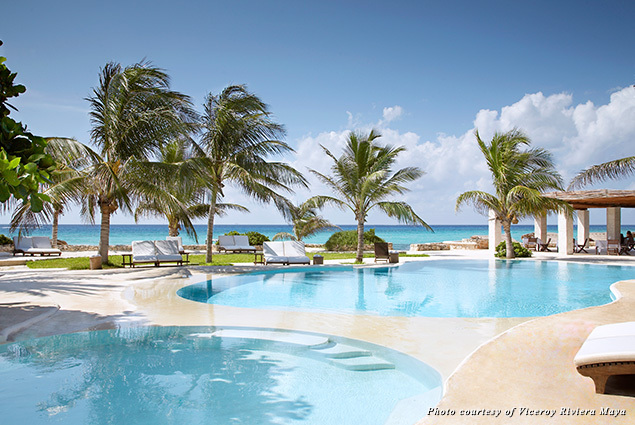 The Viceroy’s Riviera Maya property is situated between the Caribbean Sea and the Maya jungle in the small village of Playa Xcalacoco near Playa del Carmen. 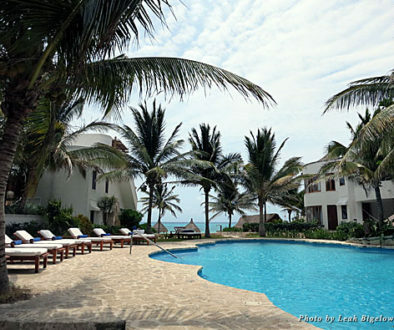 The boutique hotel is for adults only, giving the property more of a honeymoon-getaway feel than a family vacation. 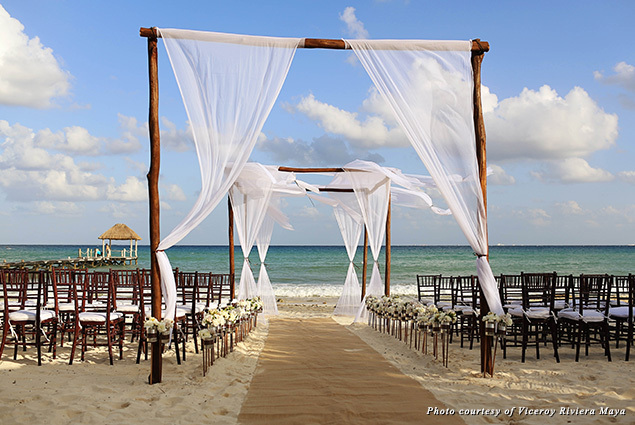 And for good reason: The Viceroy hosts numerous weddings on the property throughout the year, both the traditional variety and, in homage to its surroundings, Maya wedding ceremonies performed by a local shaman. Upon arriving at the Cancun airport and driving 40 minutes south to the Viceroy, my boyfriend, Ed, and I were greeted with a welcome drink and a tour of the property. The hotel consists of 41 private villas tucked among the property’s jungle-like gardens, often providing views of monkeys playing in the trees above. Even more impressive than the gardens was the centerpiece of the grounds: an infinity lagoon pool just a short distance from the beach. After winding our way through the property we arrived at our room, a beautifully decorated, 1,000-plus-square-foot villa complete with ample seating, a satellite cable television, a DVD player, an iHome docking station, a mini bar, and a king-size bed with Egyptian cotton bedding and down pillows. The villa also included a large his and hers closet and an adjoining bathroom equipped with Neil George bath products and Italian linen bathrobes and slippers. 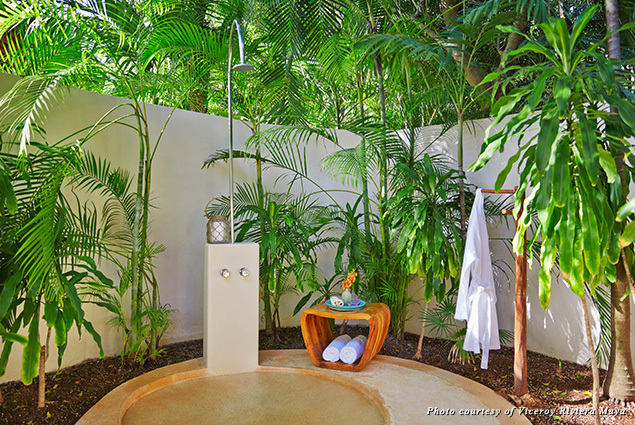 A door in the bathroom led to a private outdoor area with a rain shower. 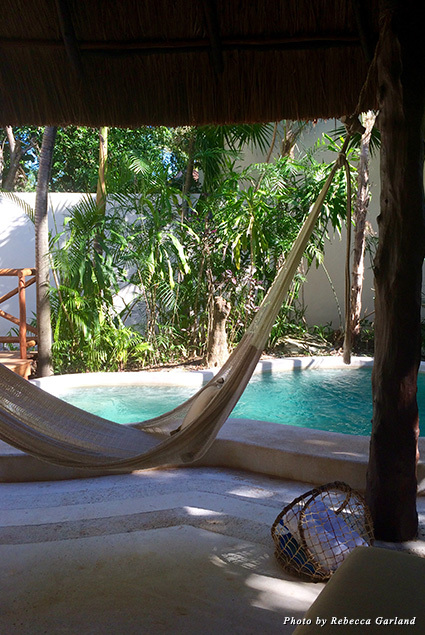 The highlight of the villa was the private sunbathing deck complete with a hammock, sun loungers, and a heated private plunge pool. After one day at the Viceroy, we realized it was going to be tempting to never leave the property—or the private pool at our villa. 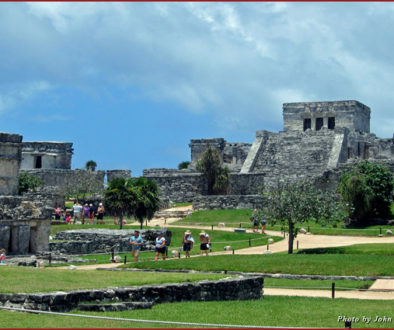 Instead of giving in to temptation, we decided to spend a day in Tulum, a small coastal city that was built and inhabited by the Maya people. 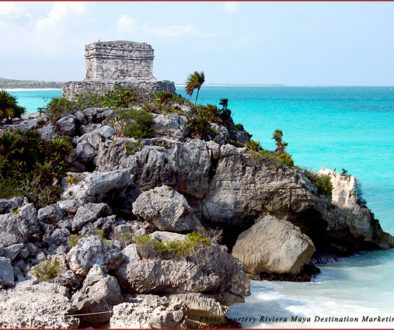 The Maya history and influence—and a good dose of what can only be described as magic—still exists in Tulum. 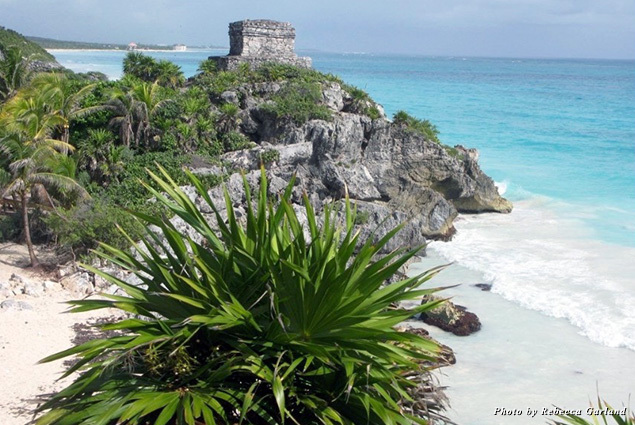 One of our first stops was to tour the picturesque Maya ruins that are perched above a beautiful beach in Tulum. As part of our Maya archaeological tour, we drove 45 minutes northwest of Tulum to the Coba Ruins. Along the way, we stopped for a swim at Gran Cenote, one of the numerous underground freshwater sinkholes located throughout the Yucatán Peninsula. Upon reaching Coba, we hired a Maya guide to instruct us about the history of Coba. 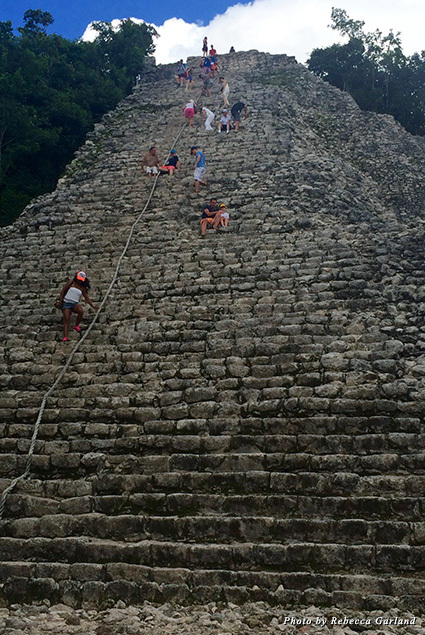 Though you can rent bicycles or take a bicycle taxi to explore the Coba site, we opted to walk followed by a climb of Nohoch Mul, a 138-foot-tall temple. 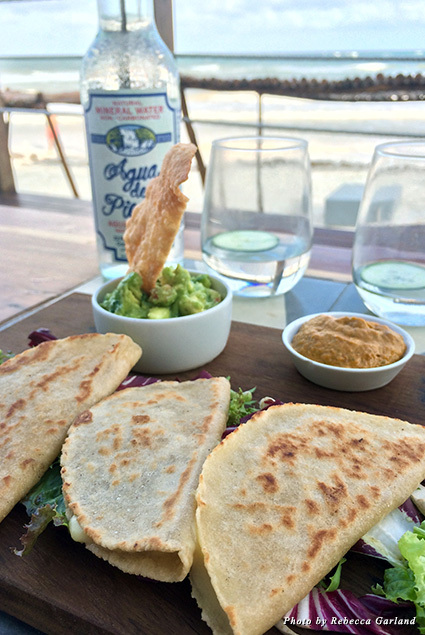 In Tulum proper, we ate lunch at Sanará Tulum’s The Real Coconut, a beachfront café with an emphasis on healthy yet delicious food free of gluten, dairy, or refined sugar. We enjoyed fresh-fruit smoothies and quesadillas made with a creamy coconut cheese and served alongside guacamole and pico de gallo. Later in the day, when we found ourselves hungry again, we opted for dinner at Posada Margherita, known for its charming beachside interior and authentic Italian food. Back at the Viceroy, our days became predictably perfect. 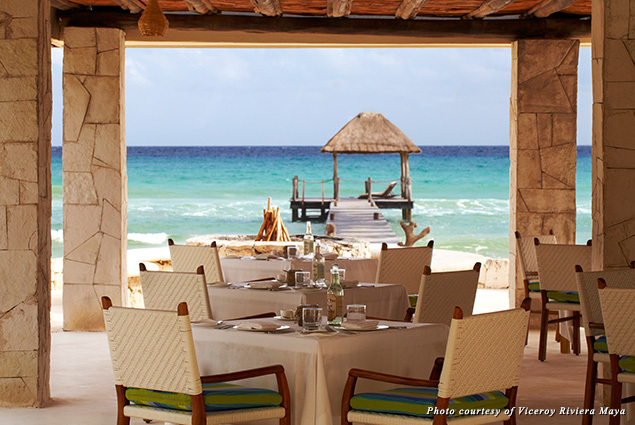 Each morning began with breakfast at Coral Grill, an open-air restaurant with beautiful views of the ocean. Breakfast was included in our room package, allowing us to freely sample the menu, which ranged from standard American breakfast offerings such as bacon and eggs to Mexican breakfast staples such as huevos rancheros, enfrijoladas, and chilaquiles. Fresh squeezed juices such as the Green Juice (pineapple, lime, chaya, and local honey) were also a highlight of Coral Grill’s breakfast menu. 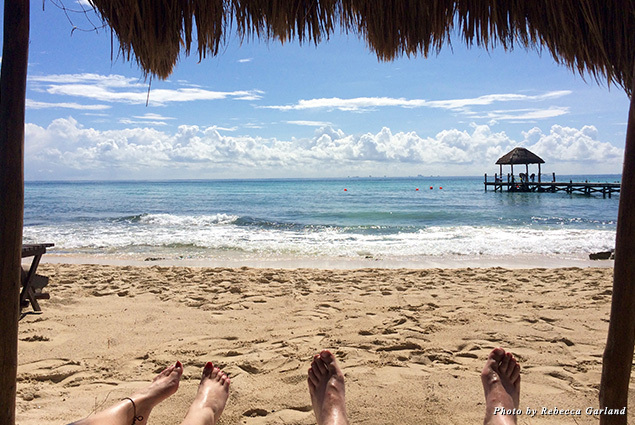 After breakfast each day, we carefully selected our beach palapa—front and center on the beach with the perfect amount of sun and shade. After setting out our towels and pillows on the loungers, the beach butlers regularly stopped by throughout the day with cold towels for our face and offers to clean our sunglasses. At around noon, we inevitably began to sample from the drink menu with various frozen beverages as well as snacks such as guacamole, ceviche, or a teriyaki tuna tostada. When we wanted to break up the routine a bit, there were ample activities to keep us busy. Ed spent a half-day deep-sea fishing with Captain Rick’s Sportfishing in Puerto Aventuras, 30 minutes south of the Viceroy. The Viceroy concierge can plan various additional activities for guests, including scuba diving, sailing, windsurfing, and water skiing. Alexis is in charge of watersports at the Viceroy, and he can provide a personalized experience of taking guests stand-up paddleboarding followed by snorkeling in the best offshore spots near the hotel. For those more interested in land-based activities, the Viceroy has a fitness center with cardio and weight machines as well as free weights. 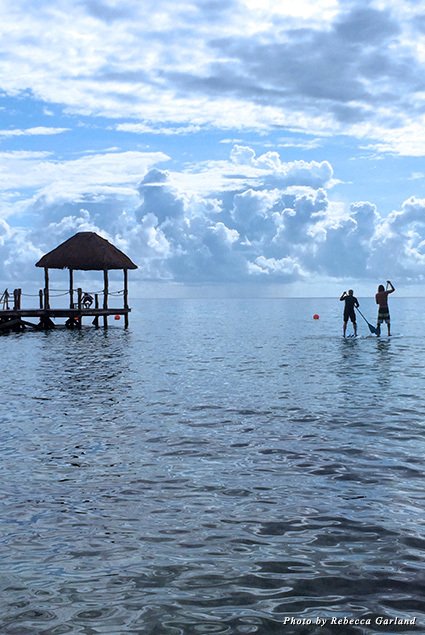 Yoga classes are offered each morning on the Viceroy’s overwater pier, and tennis is available for Viceroy guests at a nearby property. 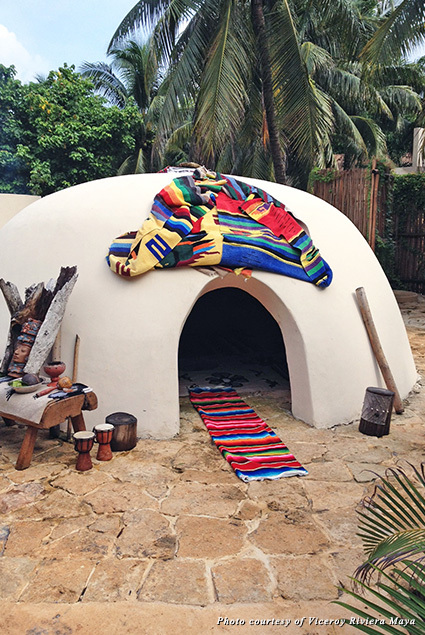 And if guests choose not to be active at all, the hotel has a full-service spa complete with two steam rooms, two Jacuzzis, indoor/outdoor couples suites, and a traditional Maya Temazcal (a sweat lodge). 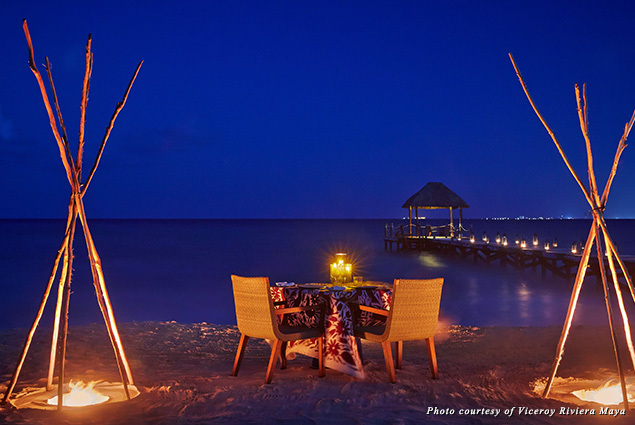 In the evening, the Viceroy serves dinner at either the Coral Grill or La Marea, a fine-dining restaurant located in an open-air, loft-like setting with views of the pool and ocean below. 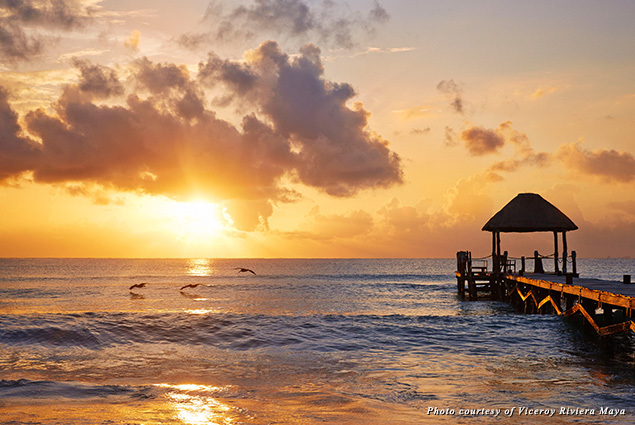 In addition to the two restaurants, the Viceroy has a “dine anytime, anywhere” policy, which means guests can sample the menus of Coral Grill or La Marea at a dining table placed on the beach, by the pool, on the pier, or on the patio of a private villa. On our last night at the Viceroy, we booked a couple’s massage that was performed at the end of the hotel’s pier, beginning at sunset. 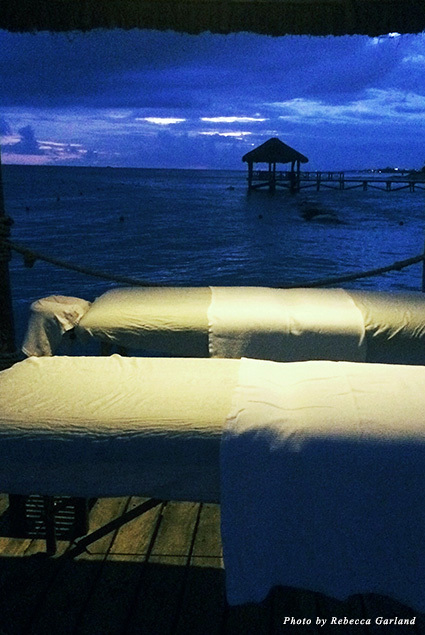 The only sound we heard during the 75-minute massage was the water below, and after it was over, as we stirred from our massage haze and opened our eyes, the moon and stars were shining above the water. It was a magical experience and a magical place, one we hope to return to again and again.